The International Rescue Committee, which responds to humanitarian crises to help people rebuild their lives, has a program called New Roots that assists refugees with growing fresh produce for themselves and their communities. They have a fundraising goal of $45,000, and they’re getting closer to it each day. One of the eight cities with an active New Roots program is Dallas where a pre-existing community garden that had fallen into disuse was restored two years ago. Currently, a group of women from Bhutan who had former gardening knowledge are growing enough produce to provide for family meals and to sell at White Rock Local Market. Jim Stokes, the Employment Supervisor in the Dallas office, explained: “It’s a nice way to empower these ladies who have skills.” Some of the most popular vegetables being grown are long beans, Malabar spinach, and pumpkin or squash vine tips. I didn’t even know squash vines could be eaten, but I was sent a recipe for vines that are cut into one-inch lengths and sauteed with mushrooms, bell pepper, tomato slices, and lots of spices including Szechuan pepper. I can't wait to try this as soon as I can get some vine tips. Edible Dallas/Fort Worth recently included a story about this New Roots garden, and a type of squash that goes by many names. 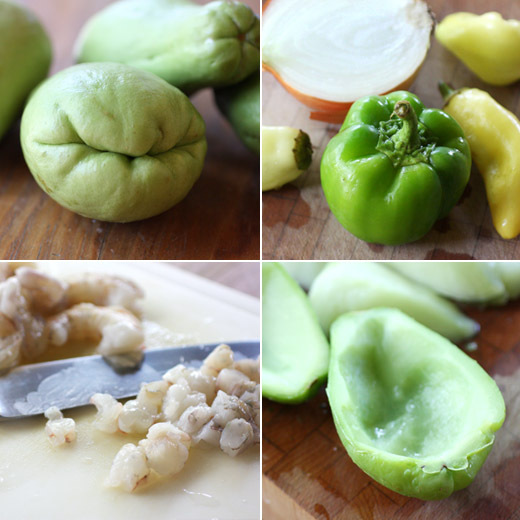 The ladies from Bhutan call it iskus, but it’s also known as chayote or mirliton. I remembered a cooking class I attended where I learned a recipe for stuffed mirliton that I had never made at home. It was time to try cooking this squash. Mirlitons are pear-shaped with a squeezed-in end that looks like it’s smiling at you. They look like they would have the texture of a zucchini, but the flesh is actually firmer and requires a little more cooking time. Hollowing them out, mixing the chopped and cooked flesh with seafood, and stuffing the shells is a common use of this squash in Louisiana. Ham is usually involved, but I, of course, skipped it. My version of the stuffing is a mix of chopped shrimp, crab meat, diced sweet peppers, onion, garlic, parsley, oregano, thyme, panko, and egg. 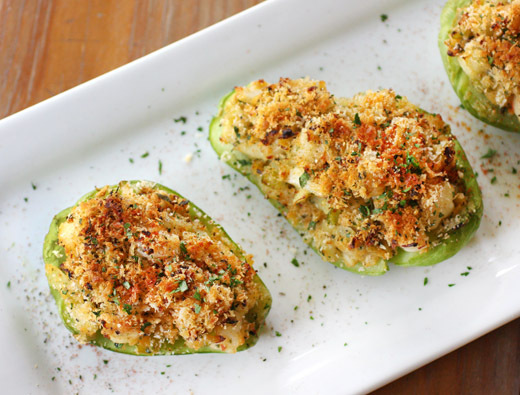 The stuffing in the squash shells is topped with breadcrumbs tossed with parmesan, parsley, and oregano before being baked. If you happen to be in the Dallas area, stop by White Rock Local Market for the fresh, locally-grown vegetables you expect to find and maybe a type of squash or two you haven’t seen before. And, learn more about the IRC and the New Roots program online. Adapted from a recipe by Sara Roahen for Central Market Cooking School. Place whole mirlitons in a large pot and cover with water. Bring to a boil, and cook for 20-30 minutes until tender when poked with a knife. Drain, and let mirlitons cool. Cut each mirliton in half lengthwise, remove the pits, and carefully scoop out the squash flesh leaving some attached to the skin for sturdiness. Dice the squash flesh, and place the mirliton shells in a baking dish. Preheat oven to 400 degrees F. Mix together the panko breadcrumbs, oregano, parmesan, cayenne to taste, and two tablespoons of the parsley, and set aside. In a large saute pan over medium heat, melt the butter with one tablespoon of olive oil. Add onion and sweet peppers, and cook for a few minutes until softened. Add garlic, thyme, bay leaf, remaining parsley, and diced mirliton. Cook over medium-low heat, white stirring occasionally, until the vegetables are all completely tender, about 15 minutes. Add shrimp and cook until opaque which should only take a minute or two. Then, add the beaten egg, about three-fourths of the breadcrumb mixture, and salt, pepper, and hot sauce to taste. Stir to combine, and then gently fold in the crabmeat so as to keep the lump meat intact. Divide the stuffing among the mirliton shells, mounding it up, and sprinkle the remaining breadcrumb mixture on top. Drizzle the mounds with olive oil, and bake for about 30 minutes or until the topping is golden brown. If you’re not happy with the color of the breadcrumb topping after 30 minutes, you can always place the stuffed mirlitons under the broiler for a few minutes for more browning. I love mirlitons! This dish is just wonderful. I know this squash by the name chayote but have never cooked with them. I must say stuffed to the top with crab and shrimp these mirlitons look indulgent! A great dinner recipe for an often overlooked vegetable. I love the mission of the IRC...I wish them much success. I haven't seen this squash around here, but that filling looks amazing! I'll find something to stuff with it!!! Sounds like a great cause. I have not heard of this type of squash. 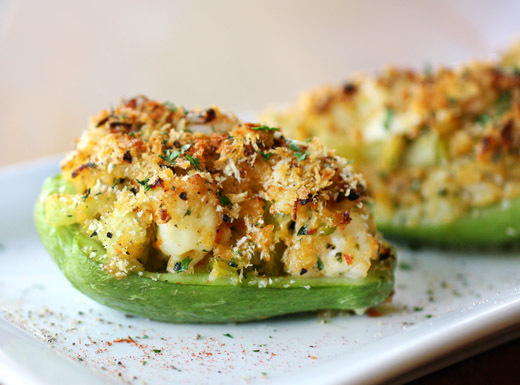 But the squash with the filling looks amazing. What a great cause this is and brilliant idea to have these pretty ladies work the gardens... I had never heard of this squash before either and it somehow makes me think a little bit of quince... Not sure why as I'm sure they taste very different. Love your stuffed version! What a wonderful idea! :D Love the photos of the ladies at work too :) I've never seen mirlitons, I wonder if e get them here under a different name (but I don't think I've even seen them). I know it by the name chayote. Would love to try this recipe as well, Lisa. The IRC is a great cause and I trust they will reach their goal. Great cause. And this is a new squash to me - I haven't heard of mirlitons. Looks terrific - thanks so much. I had these mirlitons before in a coconut curry soup (growing up in Indonesia). They are delicious. Great cause Lisa! Now I would be the happiest guest of all at your table, to enjoy this great take on "chuchu". on a side note, LIsa - one of the books you are reading, Key to Chinese COoking, is simply amazing! I feel in love with it the moment I first opened it, and wish I had a little more free time to indulge. Fantastic book! Sally: I posted a couple dishes from the Key to Chinese Cooking a long time ago. It's such a classic book. I learned a lot from it! That is very neat program. I will check into it. And they do look like smiling :) Beautiful dish. What a great program. Thanks for sharing about it. I know those as chocho from Brazil. I never made anything with them. Your recipe looks delicious. I've seen them in the markets here so I may have to finally give them a try. Are mirlitons same as chayote? They are so versatile in many recipes. what an interesting piece of produce! i've never heard the term mirlitons, but i've heard of chayote--glad you cleared that up! regardless, i haven't eaten them, but i like how you've prepared them here! I've enjoyed learning more about the IRC New Roots program in recent weeks--Thanks for sharing your personal experience. It's also great to learn about new ingredients, too. I have cooked chayotes once before, but it is a long time ago. It is nice to see a recipe again and this one looks delicious. What a great program the IRC is. I admire people that work or helping out at these organizations. I quite like mirlitons (which is called a choko in Australia). I usually steam them and have them like that. Love the idea of stuffing them. i have seen chayotes before but have yet to pick one up. now i have an awesome recipe to try next time i see them! I've never seen mirlitons and they are funny. I've actually had the idea of making stuffed vegetables a bit like yours...now I have to go carefully through your list of ingredients. They look so delicious! And a wonderful wonderful project and husband and I have been talking about taking time off to work with a project like this one. I've seen mirlitons everywhere.. Am just curious how it tastes! The flavor is very mild, similar to zucchini.